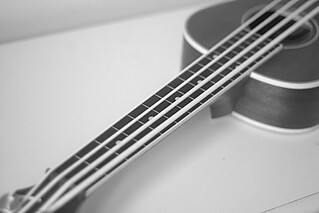 I have been a ukulele player for several years and a bass player for somewhat longer (at least 20 years by now!). It was only fairly recently (probably a year or so back) that I discovered the existence of the bass ukulele. A friend of mine (and fellow bass player) got one and let me have a go on it. I was immediately impressed by how such a small instrument (it’s the same size as a standard baritone ukulele, which is roughly the size of a viola) could manage to sound so much like an upright bass (it’s even tuned the same – at the same pitch). Although you lack the facility for bowing it, you can get a very good approximation of a plucked bass sound in a much smaller, more convenient package. I already wrote a bit about the bass ukulele a few weeks ago when I mentioned that I was due to be playing a gig with a jazz band, the Jazz Knights. As I said then, I was borrowing a bass ukulele (the same one that I had previously seen, from the same person) for that gig. The gig itself went really well and everyone seemed to like the bass uke. We decided to keep going as a band. At this point, I decided the time had come to get a bass ukulele of my own. Looking around, I managed to find an attractive looking deal for a fretless bass ukulele at Thomann, a German online music shop. Although evidently not such a nice instrument as the Kala uBass that I had been borrowing, this was substantially cheaper than the cheapest Kala ukulele I could find for sale (even second hand) so I decided it would be worth a try. As I suspected, it isn’t such a finely crafted instrument as the Kala but it seems to be pretty well put together nonetheless. At first, I wasn’t at all keen on the white polyurethane strings (the Kala has black ones) but I’m getting used to them and beginning to think they actually go quite well with the white trim on the body of the instrument and the “fret” lines on the fingerboard. It is probably just as well that the fretless fingerboard is lined, since the hand spacing is quite different from most stringed bass instruments due to the considerably shorter scale length. Even with this visual aid to help, I’ll probably need to do a fair amount of practice to get the hang of it. To some extent, there’s a similar problem even with a fretted bass uke (such as the Kala I was playing), but the frets are certainly more forgiving of slight inaccuracies in finger placement. One feature of this instrument that was lacking on the Kala is onboard volume and tone controls, which could be quite useful for adjusting my sound in the middle of a gig (or muting the instrument temporarily, e.g. to put it down) if I’m unable to reach the amplifier. The flip-side is that, while the Kala had purely passive circuitry, this one is active (powered by a couple of lithium cells) and evidently won’t work if the batteries are removed (or dead). Having played for a number of years on a borrowed upright bass called Claudia (so named by its owner), I resolved that if ever I got an upright bass of my own I would call it Gloria. Since it currently seems unlikely that I will be getting an upright bass any time soon (certainly while I live in such a small house) and since the bass uke is such a good substitute for one, I’ve decided to call my new uke Gloria instead (I’ve also got the name Bertha reserved for the – also highly unlikely – eventuality that I should ever get a tuba to call my own).